Gone to See Norway 2013 Chasing the Northern Lights. 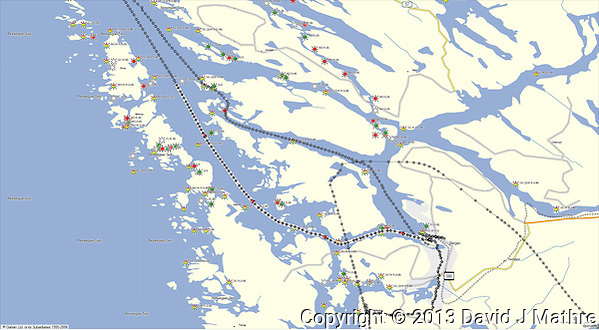 Day 3: Bergen then Embarkation on the Northbound Hurtigruten MS Nordkapp Norwegian Coastal Voyage. Early to bed, early to rise. I received an e-mail overnight from PSE&G indicating they expected a winter storm back in New Jersey with the potential for power outages. I was glad that I remembered to turn the water off before leaving the house. I had a hearty Scandinavian breakfast at the attached Egon restaurant. I didn’t need to checkout of the hotel until noon, so went for a walkabout in Bergen. The rain had stopped, but it was a bit chilly. It was still dark out, with sun not rising until 08:59. I first went to the fish market, hoping to get some early morning pictures of fresh Norwegian fisk. The tents that remember housing the fish market in the past were missing. I then walked out to the location on the map listed as the commercial fish market. When I got there, I realized that wasn’t what I was looking for. I then walked back to the entrance for the Fløibanen Funicular. The Funicular is a cable driven train that provides a ride to the top of Fløyen mountain. During the winter season, the ride is free with the Bergen card. I missed the first ride at 07:30, but was able to catch the 2nd ride at 08:00. This would still get me to the top of the mountain before sunrise. Even though the ticket office wasn’t open (needed to get the ticket) the Funicular operator let me in and got me the front seat. While waiting for the train about 20-30 pre-school/kindergarten age children were dropped off by their parents to ride to the top of the mountain. The kids were all wearing heavy winter coats and had backpacks. When the kids and their 3 adult guides got to the top they stopped to sing a song, and then went for a hike. 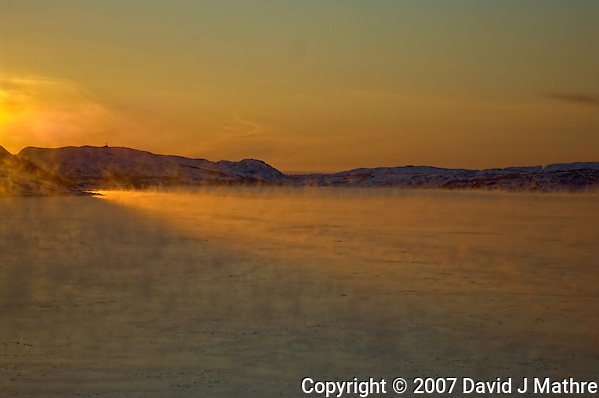 It was cold at the top of the mountain, and I put on another layer before taking pictures of Bergen at dawn. The kids seemed to have disappeared into the woods. 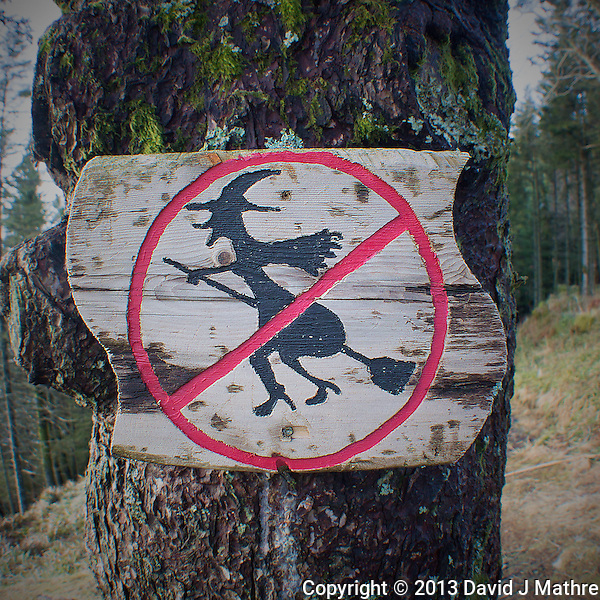 You could hear them yelling and having fun — It surprised me that they were running around in the still dark woods. 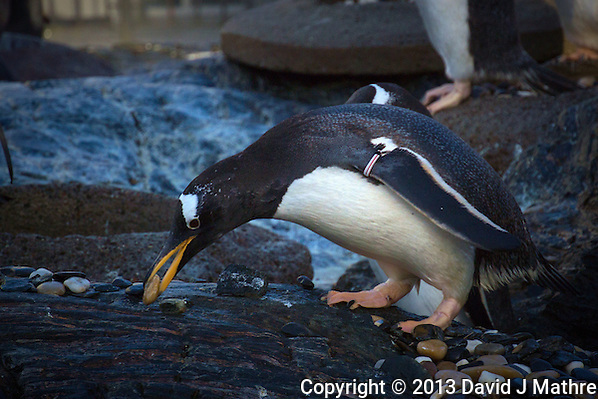 After the sun rose, I returned to Bergen and walked to the Akvariet i Bergen (Bergen Aquarium). Again free entrance with the Bergen card. There were some interesting displays of northern and arctic fish, a room with tropical reptiles and snakes, and a hands-on display of sea creatures that would be found in tidal pools. Outside there was a pool for seals, and a display with Penguins. There were at least 3 groups of pre-school/kindergarten age kids at the Akvariet. When I walked back to the hotel to check out, I saw why I didn’t find the fish market earlier in the morning. They moved the fish market (and a flower market) indoors under the Bergen Tourist Information center. The same place I went yesterday to buy the Bergen Visitor card. I had a fresh salmon sandwich and Coke for lunch (120 NOK). I passed on the Fisk Soup (200 NOK) although it smelled good. The folks working at the fish market said they moved into the new location last year. They still do have the tents up in the summer when more tourists are in Bergen. One thing I noticed during this visit to Bergen were a number of folks sitting out at corners with cups begging for change. They did not look local, and the locals did not appear to be giving out any change. I checked out of the hotel and continued to walk around Bergen. I found the Japanese Photography shop where I went to look for some lens cleaner. They didn’t have any in stock – but went to the backroom and gave me an opened bottle for free. 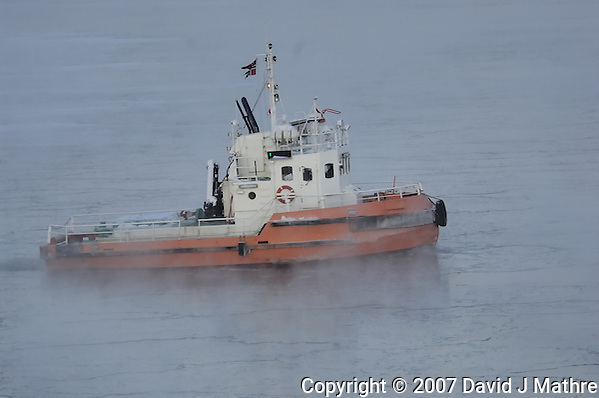 Later in the afternoon, I went back to the top of Fløyen mountain to watch for the arrival of the Hurtigruten MS Nordkapp. 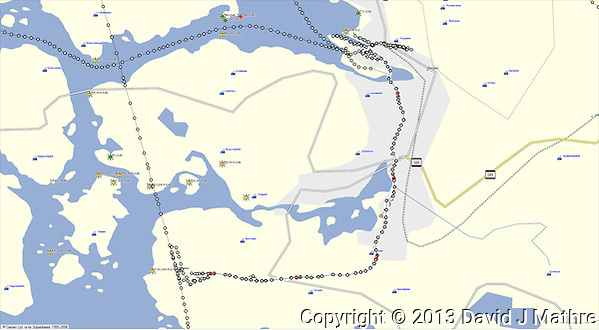 I wondered how many of the folks watching the MS Nordkapp arrive would be riding on the Northbound voyage that evening. There were also a number runners doing a race up the mountain that afternoon. I think some were making it up the mountain faster than the Funicular (which does have several stops). 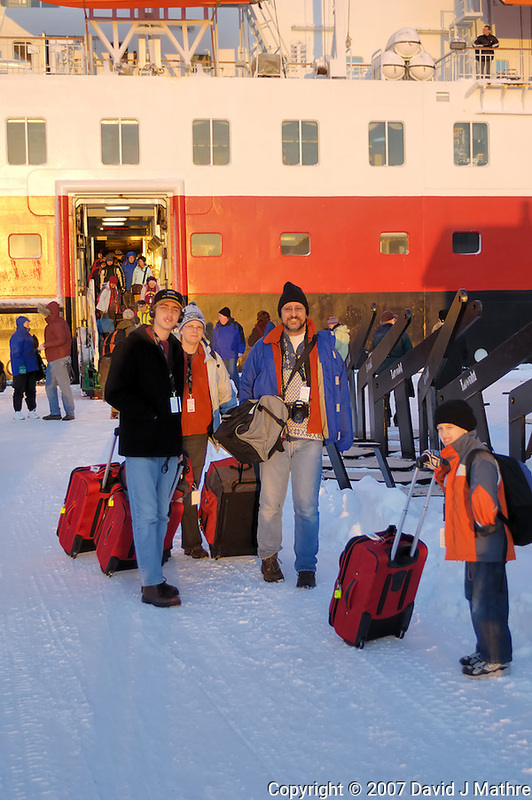 Check-in at the Hurtigruten terminal was fast. No passport or credit card required. They took my heavy bag and delivered it to my cabin. Before boarding the ship, there was a mandatory safety program. One notable difference between the Hurtigruten ships and the Semester at Sea MV Explorer is that the life vests (and all weather suits) for the Hurtigruten ships are kept on deck 5 with the lifeboats. On the MV Explorer, the life vests are in the cabins. My cabin on deck 3 had a set of bunk beds and a couch that could be folded open for a 3rd bed. The desk was very small and barely held my laptop computer and various battery chargers. Unlike my previous Northbound Hurtigruten voyage out of Bergen, there was an open seating buffet dinner before we departed. 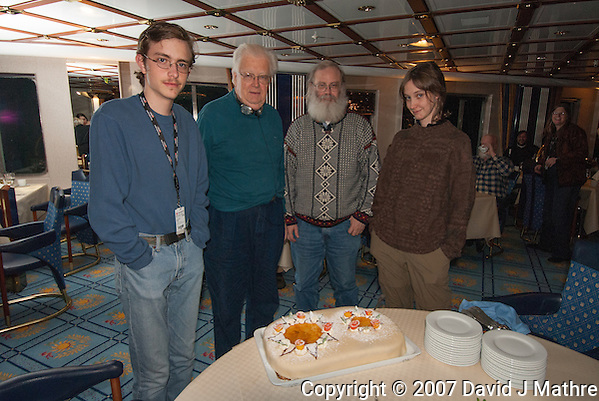 Once on board, we were told that there was a German TV crew that was going to be filming the Northbound voyage. Included with the TV crew were a couple of radio controlled helicopters (drones) to do some of the filming. The ship departed on time at 22:30. 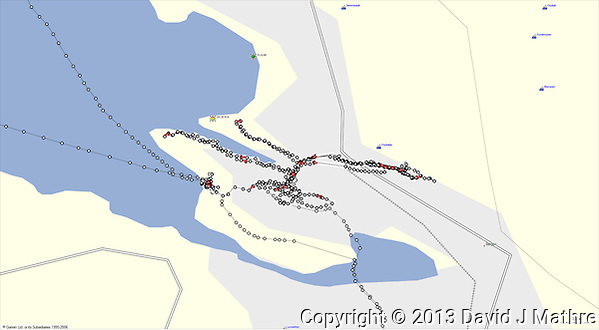 Once I downloaded the GPS track for my Bergen walkabout, I realized why my feet were so sore. During the day I walked over 14 miles (not counting the two trips up and down the Funicular). Gone to See Norway 2013. Chasing the Northern Lights. Day 2: Copenhagen to Bergen. 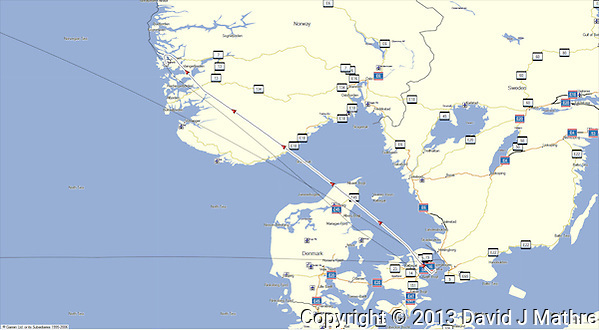 I arrived in Copenhagen at 07:00, earlier than expected due to the favorable tail winds. It was still dark and raining. I have to get used to the sun rising later as we get further north. There was a long line waiting to go through passport control. It didn’t matter since my connecting flight to Bergen wouldn’t leave until 11:45. I was glad that my luggage was checked all the way to Bergen. I was probably early enough to catch the 08:30 flight to Bergen if it wasn’t for the size of the Copenhagen airport. It is more a shopping center than an airport terminal. I exchanged some currency and then found a quiet area in the airport with free Wi-Fi and comfortable seats to sleep. A bottle of Coke at the airport cost 22.5 DK. The SAS flight from Copenhagen to Bergen was on a MD-82 jet. The plane was only 1/3 full, so no problem finding space for my camera bag. Heavy rain when we landed in Bergen. Passport control in Bergen was closed, so only needed to pass through customs. It appeared that they were only checking Norwegians for excess duty items. One interesting thing is that you can use coins from a variety of countries for the luggage carts. There is a chart showing the size and value of coins that will work. With my heavy bag, I opted to take a taxi from the airport to my hotel in Bergen (376 NOK). The Thon hotel had a room when I arrived. 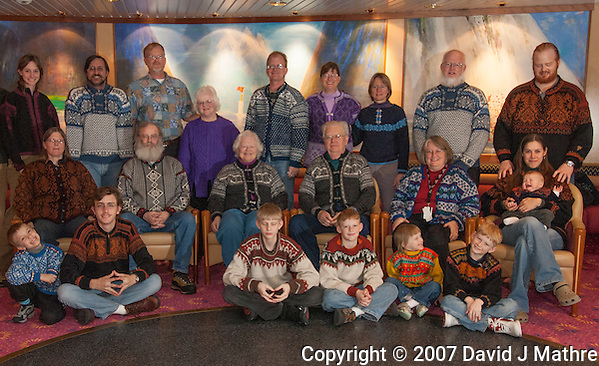 Unlike earlier visits to Norway, the hotel did not ask to see a passport. Had a late lunch (or early dinner) – cheeseburger, fries, and a beer at the attached Egon restaurant (242 NOK). I can see that Norway is going to be expensive. I slept a few hours then walked the four blocks to the Tourist Information center to buy a one day Bergen Pass. It was still raining hard, and I was cold and soaking wet by the time I got back to the hotel. The weather forecast for the next day in Bergen was partly cloudy and above freezing. After a long day of travel, I fell asleep. Gone to See Norway 2007 Family Vacation. Day 10: Hurtigruten Coastal Voyage Traveling South. On the second day of the southbound Hurtigruten voyage, the ship stopped in eight ports: Mehamn (01:00-01:15); Kjøllefjord (03:15-03:30); Honningsvåg (06:00-06:15); Havøsund (08:15-08:30); Hammerfest (11:15-12:45); Øksfjord (15:30-15:45); Skjervøy (19:00-19:45); and Tromsø (23:45-01:30). 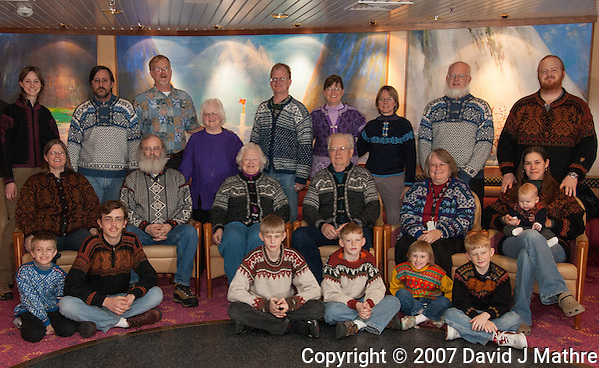 Happy Birthday Dad — From Norway. 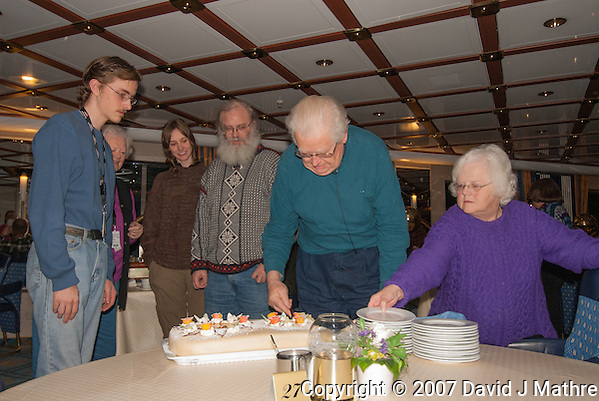 Two days earlier the family got together to have a birthday celebration for my father before the majority of the group disembarked the Hurtigruten MS Kong Harald in Kirkenes. Gone to See Norway 2013. Chasing the Northern Lights. Day 1: New Jersey to Copenhagen. The more I travel, the more I try to travel light. Going to Norway to photograph northern lights in the middle of the winter makes this difficult. I needed to include cold weather clothing and I the right photo gear. To save some weight, I decided to use my Lowe internal frame mountain backpack (saving 4.5 lbs/2 kg vs. the rolling suitcase). This allowed me to include a winter parka, long underwear, and a heavy Norwegian sweater. The backpack went into a heavy nylon bag that would go as checked luggage for the flight to Norway. In all, just under 50 lbs (way too heavy). For camera gear, I debated not taking a DSLR and only going with a mirrorless Nikon 1 V2 camera and Leica X2 camera. In the end, I did take a Nikon D800 with a 24 mm f/1.4G lens and a 16 mm f/2.8 fisheye lens. I wanted to make sure that I had a camera and lenses that would work for low light work and has an internal interval timer. Nikon removed the interval timer when they upgraded the Nikon 1 V1 to V2 model. Just before leaving I purchased an Olympus FCON-T01 fisheye converter. This adapter has the same 40.5 mm thread used by the Nikon 1 series lenses. When attached to the Nikon 1 10mm f/2.8 lens, the field of view in the camera is increased from 27 mm to 20 mm (on a 35 mm sensor camera). After including a laptop computer, 1.5 TB USB storage drive, batteries, power supplies, and cables my ThinkTank backpack weighed just under 30 lbs. Since I planned to take this bag with me on the plane, the travel tripod and walking stick went in the checked luggage bag. Not knowing what the weather would be like in New Jersey while gone, I turned the water off and drained the pipes. Over the last 3 years, power to the house has been out 21 days due to hurricanes and snow storms and I didn’t want to risk frozen pipes. Also, last week the hose to my washing machine burst. Luckily, I was home when this happened and didn’t suffer flooding. I had a car service (Ground Link) drive me to the airport. The driver arrived 30 minutes early and got me to the airport in just over 1 hour. I was not able to print the boarding pass at home due to the SAS representative needing to confirm I had a valid passport. Interesting note – while going through Homeland Security they needed to pat down my beard??? Total time from home to the departure gate was 90 minutes. 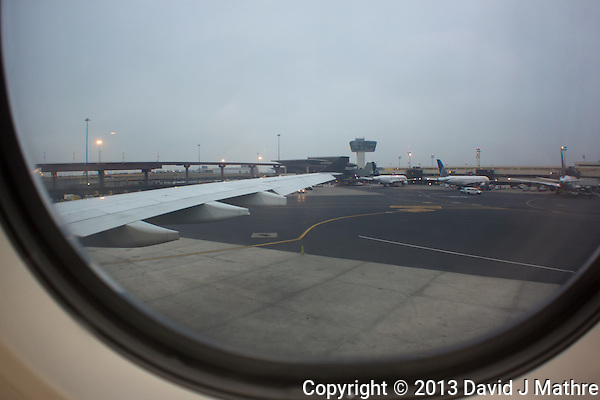 Once on board, I had a window seat near the rear of the aircraft. The seat next to me was empty and there was plenty of room for my camera bag. Early in the flight I was a bit concerned that only Business and Economy Plus would get a meal on the flight. We just needed to wait our turn and did get served a hot meal. Drinks with the meal were included. During the rest of the flight coffee and tea are free in the Economy section of the plane. Families with children were treated well on the flight. 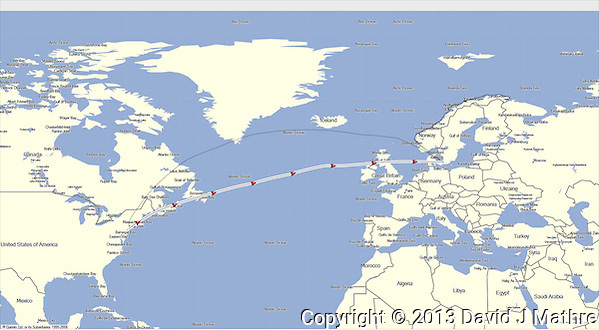 I had a Garmin GPS with me and was able to track the progress of the flight (map below). 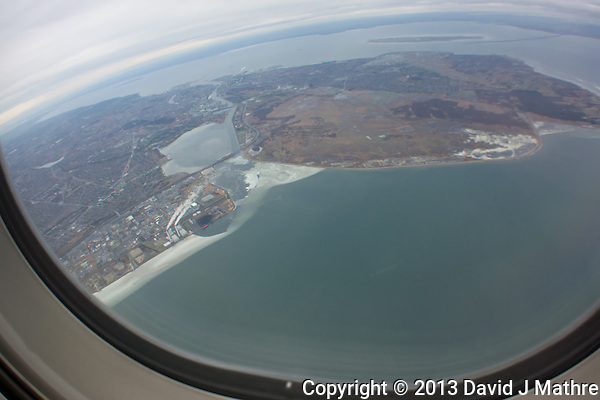 For most of the eastbound flight we had a strong tail wind. Gone to See Norway 2007 Family Vacation. Day 9: Hurtigruten Coastal Voyage Traveling North Then South. On the sixth and final day of the northbound Hurtigruten voyage, the MS Kong Harald stopped in four ports: Båtsfjord (00:30-01:00); Vardø (04:00-04:15); Vadsø (07:30-08:00); and Kirkenes (09:45-12:45). After spending 3 hours in Kirkenes, the ship turned around and began the southbound voyage stopping at three ports: Vardø (16:00-17:00); Båtsfjord (20:00-20:30); and Berlevåg (22:15-22:30). 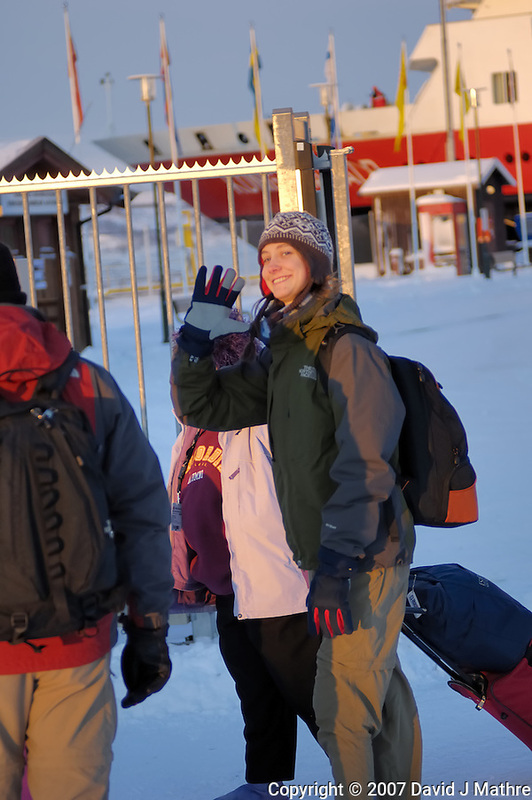 All but three from our group disembarked at Kirkenes to return to Florida.